Michael Matson exemplifies the statement “that if there is any truer measure of people than by what they do, it is by what they give.” His many years of involvement with The Dressage Foundation has shown Michael first-hand the good deeds that can be accomplished with some careful planning. My passion for musical freestyles began in the mid 1990s after seeing video of Anky van Grunsven riding Bonfire, and Klaus Balkenhol riding Goldstern, perform their amazing freestyles at the 1994 World Equestrian Games. The combination of music matched to a "dancing" horse was eye opening! After reading "Dancing with Your Horse" by Mary Campbell and attending a freestyle clinic, I knew I wanted to get more involved. And thus the journey began! At that time I had a Russian Arabian (Delmaal) and rode individual freestyles and Pas de Deux with him several times. I found there is nothing better in dressage than "dancing" with your horse! In the process of getting involved with freestyles, I found the hardest part was finding music for the horse. Searching for the right music by buying CDs was a "hit or miss" proposition. As a scientist by training, I knew the answer was a data base of music suitable for horses. Starting in 2000 I began the process of creating that data base, which culminated in my web site www.equimusic.com - a free online resource of music to ride to. I also give "Ride to Music" clinics to expose people to how much FUN it is to ride to music! As a member of the USDF's Freestyle Committee, I work to promote freestyle participation and recognition for freestyle performance. My most significant contribution on that committee was the initiation of the USDF Freestyle Rider Awards, which recognize achievement in freestyle performance. Matson always knew he wanted to do something more, to give back to the sport that had won his heart. In 2003 I initiated a call to John Boomer of The Dressage Foundation to explore the possibility of establishing a fund to support and promote musical freestyles. With the support of other interested individuals and the approval of The Dressage Foundation's Board of Directors, The Dancing Horse Fund was established to accomplish that goal. Although the fund is adequately funded to support current levels of activity, I wanted to ensure it was properly funded for the long term. As I'm single, retired with a guaranteed Federal and Navy pension that are inflation adjusted, and have an uncomplicated estate, I believed the best way to accomplish the long term goal was through my will. Thus my Federal job-related equivalent of an IRA names The Dressage Foundation's Dancing Horse Fund as beneficiary when I pass. Hopefully that legacy will ensure many future riders will be smiling when they "dance" with their horse. As a Foundation Board member, Michael chairs the Dancing Horse Fund Committee. "We hope to make the sport of Dressage more widely known, understood, recognized and enjoyable to the general public through the Freestyle. We have awarded many smaller grants to help a good many groups with Freestyle," said Matson, "and we are now at work to 'bump up' the size, scope and activities of the Dancing Horse Fund." 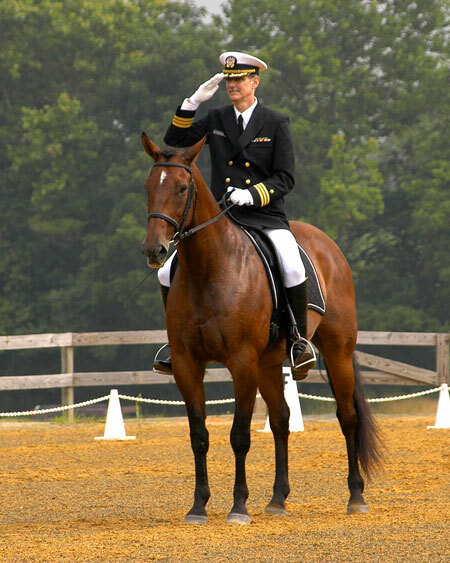 “Michael has made a large contribution to The Dressage Foundation. He is an excellent Board Member – a good thinker, a hard worker, and a charitable giver. Through his estate plan, he now arranges to continue his good help to the sport of Dressage into the future,” said John Boomer, past President and CEO of The Dressage Foundation.